Harvard Center for Population and Development Studies, 9 Bow St. Tue., Feb. 12, 2019, 4 – 6 p.m. Climate change threatens humanity and the planet on which we live. Social inequities, including startling variance in the health outcomes that different population groups enjoy, also pose a threat to humanity, although less directly. Together, the scale of devastation these threats pose is unprecedented…but wholesale destruction is not inevitable. Humanity can and must act to prevent catastrophic climate change and redress egregious global health inequities. It must act now. Organization/Sponsor: Planetary Health Alliance; Harvard Center for Population and Development Studies; Harvard T.H. Chan School of Public Health; Harvard University Center for the Environment; and C-Change: Center for Climate, Health and the Global Environment at the Harvard T.H. Chan School of Public Health. 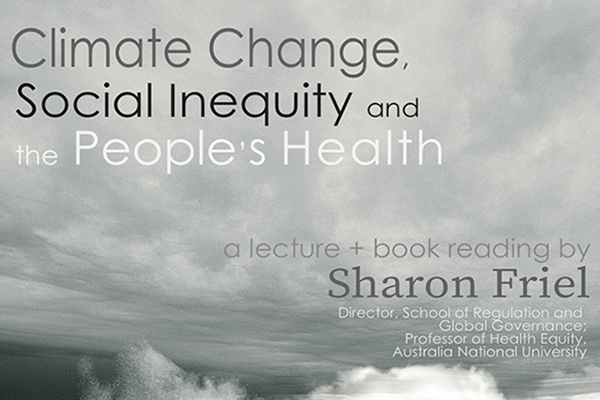 Speaker(s): Sharon Friel, Professor of Health Equity and Director of the School of Regulation and Global Governance (RegNet) at Australian National University, She will read from her new book “Climate Change and the People’s Health.” She will be joined by series editor Professor Nancy Krieger. Copies of the book will be available for sale and signing. Refreshments will be served. Open to the Harvard community.